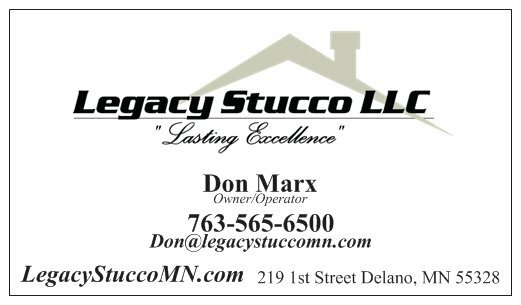 Legacy Stucco LLC was formed on the premise of “Quality Craftsmanship”, “Guaranteed Workmanship”, “Dedication to Detail”, and the commitment to “Lasting Excellence”. Whatever your project may be, small to large, we’ll take great pride and care in craftsmanship, workmanship, and detail because the name of Legacy Stucco stands for “Lasting Excellence”. I hired Legacy Stucco to do some interior work at my home. I was impressed with the creative ideas and many color and texture choices Don offered to me. He fully understood the vision I had for the space and accomplished exactly what I had hoped for. Legacy Stucco’s quality of work is unsurpassed and the professionalism of his crew cannot be beat. I would highly recommend them for any remodeling or repair needs you might have.